Beyond Where You Stand: In a World . . . It is very easy to imagine the pitch for the small but wonderful movie In a World . . . as "a romantic comedy set in the cut-throat world of voice-over casting." The pitch might be easily accepted or dismissed, but the the movie itself proves to be charming and delightful in all the best ways, and also unexpectedly, powerfully (yet quietly) empowering. 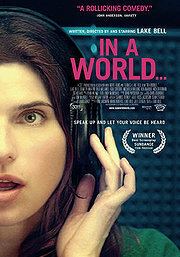 It is clear writer, director and star Lake Bell has a savvy knack for using all the familiar Hollywood narrative peaks and valleys to get at a deeper point and more sincere emotions than in any ten run-of-the-mill rom-coms. Nice to see that going off the beaten path can be such a rewarding and satisfying course sometimes.